Notes: "It would have been mostly seafarers who took advantage of the great variety of services provided at this establishment near the waterfront. Each proprietor had an eye-catching display, but none so arresting as the ship carver's models at the second floor windows. Before these businesses moved into the building, The Public Ledger was published here in 1837. The Anthracite Building in the background is reminiscent of the early coal business in Philadelphia, which developed into a big industry after 1820. At this time the city received its first shipment of anthracite coal, weighing over 300 tons." --OPEP, p. 28. Notes: The intersection, unpaved street with patches of snow. Commercial buildings with signs: "J.B. Irwin & W.H. Young, Carvers" ; "J.B. Smith Pattern & Model Maker" ; "Tobacco imported and domestic segars of the best brands" ; "Victor Grimm Practical Hair Cutting" : "Clark & Son's Painting ..." ; "Mercantile Hotel" ; "Anthracite Building". 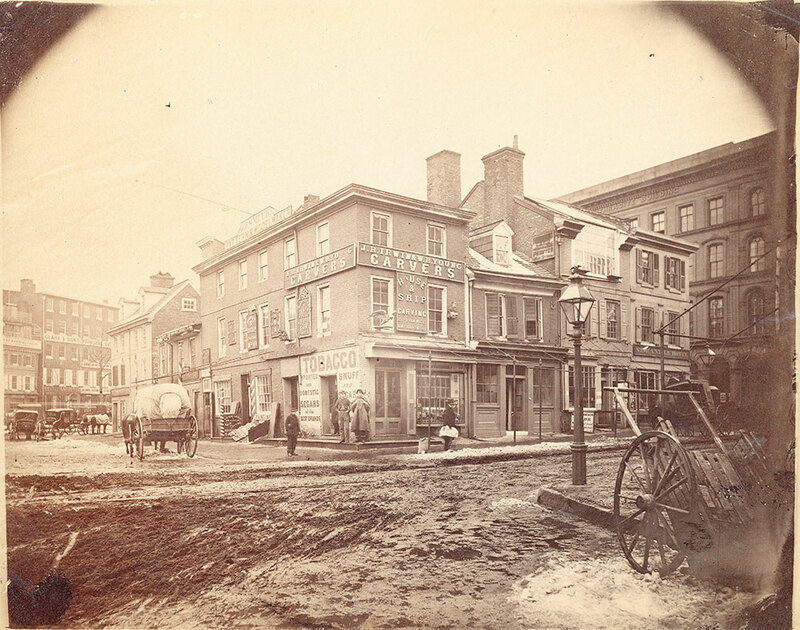 Men stand on corner, carts and horse-drawn wagons on street. Street light on sidewalk.